It can sometimes feel overwhelming to consider the multitude of responsibilities that face the modern web developer. Having the right tool for a job can make all the difference. However, even identifying and defining what types of work you’re responsible for as a developer is half the battle. Knowing which tools exist and how to use them is the other half. This session covers both fronts. Join us as we assess the many different hats a developer wears in the modern age as well as which tools are best suited for the work! We have a lot of different responsibilities as web developers. Depending on your role – that is, whether you’re an independent contractor, part of a team, or part of team leadership – and your area of focus – back-end, front-end, sysops, QAT – you and your colleagues may use wholly different tools and services with no overlap between you. And that’s perfectly okay! The problem this creates, though, is how do you find the best tool to suit your needs when everyone is doing things slightly differently than you? The aim of this session is to help you identify just a few of the many different tools and services that exist and underscore why each may be the best candidate for the things you’re doing. Some products and services will fill many needs while others will support only one. Sometimes it’s best to pick many best-of-breed single-purpose tools rather than something that does many different things (but is terrible at most of them). In this presentation I’ll share my personal experience with the tools that I like for each of the many different things I’ll do in a given week. However, I recognize that my single perspective is insufficient for the goal of this talk and to combat that I’ll also share what many of my colleagues are using in their day-to-day roles. We have a lot of topics and tools to cover, so sit down, buckle up, and enjoy the ride! What are expected/acceptable responsibilities for a developer? Which tool or service is great for ______? What are the most useful educational resources? 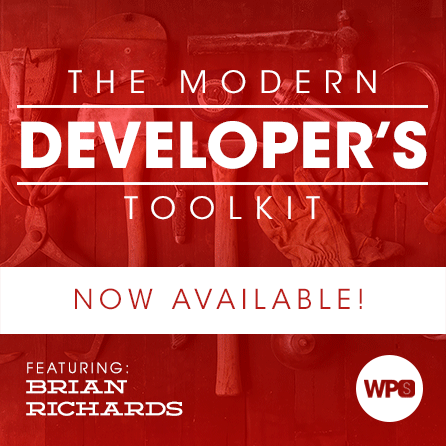 Brian Richards has been using WordPress since 2007 and leading development teams since 2011, most recently within Crowd Favorite. Over these last several years Brian has had the opportunity to work with many amazing WordPress experts and agencies and help develop sites for Microsoft, Disney, TIME, YMCA, and numerous others. Brian has an affinity for self-directed learning and helping others to develop skills and workflows to better solve important and complicated problems.